Best screen recorder on Window 8 for you to capture Screen and Audio. There can be many reasons as to why you need to record computer screen on your Windows 8 PC. Whether you want to record your screen for revision purposes, whether you want to have a particular video or movie on your computer save list, or even if you are the proud owner of a gaming page on YouTube and need to record your gameplay. Recording your screen on Windows 8 does not need to be something that is difficult. And there are extensions and softwares in place to aid you in recording on Windows 8. Among the top screen recorders for Windows 8 , we recommend you to try Filmora scrn Screen Recorder Software. Filmora Scrn allows you to record the screen, the voice, the system audio Windows 8, so all the sound can be recorded as you like. Besides the sound recording, you can also record the webcam video easily with Filmora scrn. During recording, you can add markers to the important frames when you playing a game. If you don't want to download any software, the build-in Step Recorder is a tool that you can use. However, the recorded outcome is the exact steps, not video, so if you want to have video, just skip this part, and go to next part on Windows 8. Step 1: Press Start button on keyboard, and then click Accessories > Problem Steps Recorder > Start Record on Windows 8. Step 2: Now, start doing what you want to be recorded. During recording, you can choose Add Comment to input texts. Then click OK. Step 3: If you want finished, select Stop Record. The recorder file is a zip folder on Windows 8. Awesome Screenshot is a service that works via Google Chrome and is very much one of the top rated screen capture & image annotation tools available to the public. They have done something for their user base in the form of removing all in-app purchases and making all features including those that were previously premium features. Free for all to use on Windows 8. Due to the fact that it is a Google Chrome extension it is for capturing web pages - any part of a web page at that. From comments and annotations, to blurring sensitive information it can all be done with extension. Step 2: Capture your video - You can decide what section of the screen if not the whole screen. Supports both PNG and horizontal scrolling, can capture desktop screen. Step 3: Annotate & Edit - You can add comments, shapes and annotate how you like, you can then edit the video and share a screenshot to social media. Step 4: Save & Share - Save to your local disk, once uploaded to the Awesome Screenshot website they will provide a shareable link. Ezvid Free Screen Recorders is one of the best free screen recording software on Windows 8. Ezvid records computer screens but not just websites but games and everything else you may want to record. It has very many features that include a facecam, voice synthesis and screen drawing. Step 1: Download and Install Ezvid Free Screen Recorders latest version on Windows 8. Open the software. Step 3: Edit the video. You can add marks, lines and color to highlight the area that you think it is important. Step 4: Save & Upload - The software has an upload to YouTube button. Clik upload diectly to share your recorded video to YouTube. Filmora is an editing tool for professional video recorders and editors. Voted 4 out of 5 stars it can be used as a brilliant alternative editing software to Windows Movie Maker and iMovie for those on Macs. As a user of Filmora Wondershare there is no doubt that you will be impressed with the number of functions that are available with the software and also the general capability of it. In terms of what videos you can import and edit etc. 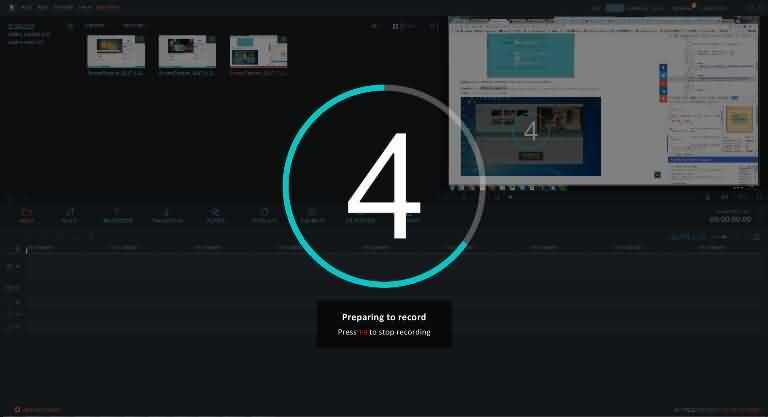 On its newest release of Filmora, it will no longer just be a video editor but it will have a screen recording function added to it as well, as well as a video stabiliser and reverse tool. Best thing about this is current users of the software will be able to download this update complete free of charge. So, how could this function be used? Step 1: Download & Install the programme. Once opened on the upper left corner of the interface you will notice a record button, click this. Here you can either record from webcam or record computer screen. Step 3: Click record icon. If you think it's OK. Stop recording. Video is automatically saved to the software timeline for you to edit and save. These are just a few extensions and software that can be used to record computer screens for your Windows 8 device. They are also the highest voted recording softwares in their fields. Those being chrome extension, free downloadable software, advanced software and build-in tool. Recording your screen on a Windows 8 device need not be complicated and depending on your personal needs one of these three could really help you.